As we focus on building the data structures for the new game, we continue to add wonderful back story pieces which will fit nicely into the archives and wikis of the game. The following empire description was submitted by Hugo nominated science fiction author Steve Rzasa, along with a fiction piece that we will reserve for another time. The First Kingdom of Albion had its origins in a collection of disparate groups that fled the British Isles on Earth for political, economic and religious reasons following the Terran Global Economic Disaster of 2459. They chose a star system a hundred parsecs from Sol as their new home, settling in orbit of a gas giant rich in resources. From the giant’s rings they harvested water in copious amounts, so much so that subsequent settlers to the system were obliged to do commerce with the Albion Extraction Cooperative, the only formal organization that tied together the settlers. As time wore on, and galactic and local conflicts took their toll, the AEC grew in its power. By the early 3000s, AEC controlled all commerce in the system and the myriad surrounding systems to which their operations had spread. But with great wealth comes great temptation for others to steal such wealth. Pirate activity at the fringes of AEC systems increased dramatically over the coming decades, coming to a head with the destruction of the Port York Station in 3098. This galvanized the AEC into action. It was not the action the populace expected. The settlers and citizens wanted a strong leader. AEC’s corporate board appointed Leon Seamus Gola to the crown of the First Kingdom of Albion. Titles of nobility were given to planetary governors, and both worlds and the huge space habitats in orbits of distant planets were assigned to fiefs under these nobles. The AEC’s defensive fleets were reorganized into strike forces that hunted down the pirate bands, systematically destroying them both in space and on the ground. This campaign lasted for three years, culminating in the mass driver annihilation of the Urtan pirates’ trio of planetary bases. This brutal suppression continued over into Albion society, with the nobles crushing any dissent from the people, many of whom were not keen about the business elites exercising even greater power than in the “good old days” of the AEC. When protests erupted a decade after the pirates’ destruction, the First Kingdom responded with increasingly draconian measures—suspension of free speech and rights to assembly, arrests, torture, investigation by secret police and informants, and finally, the massacre of five hundred protestors at a major arts and science university on Albion Prime on the 15th anniversary of the orbital bombardment of the Urtan pirates. What had been a burgeoning civil rights movement blossomed into full-fledged civil war. Several military units, including Special Forces companies tasked with rooting out the protest movement, instead joined with them and provided weaponry, tactics training, and military intelligence. The movement spread across First Kingdom space, encompassing all worlds and settlements of the Albionites. For six years the Kingdom was locked in a bitter struggle with its own citizens who refused to bow to a new era of royal oppression. It was not until James and Ara Yost-Kirana betrayed the leadership for the promise of safety for their own colony that the Kingdom made significant inroads toward the defeat of the rebels. Within eight months, their organization was infiltrated, poisoned, and torn apart. There was no final grand battle between opposing forces; rather, a the rebellion died with a whimper as its leaders turned on each other, tricked into assassination and blackmail by the secret police of the Kingdom. In the aftermath, the Second Kingdom of King Faraday II rebuilt from the devastation of the war, and he was wise in not only prosecuting his own military leaders for war crimes but also showing leniency to a wide swath of rebels. He pushed for reconciliation between the parties, appointing rebels and old guard AEC descendants into positions of importance. Together, they expanded the Second Kingdom even further, seeking trade routes to distant empires and pushing their borders with grand exploratory fleets. It was this expansion that drew the attention of the Cybers. Albion fought bravely against the Cyber onslaught, but they were no match. Over a course of a century Albion, like many human and alien empires around it, was dismantled by the Cybers and its people—those who survived—scattered to the far corners of the five galaxies. The royal line was all but wiped out; the last vestiges of even the venerable AEC were brushed aside. A determined few found refuge in the unlikeliest of places. The crew of the HMS Horizon’s Edge, leading a convoy of ten exploratory vessels and thirty refugee ships, discovered a damaged and abandoned nomad platform. This huge structure, a city in space sprawling six thousand kilometers across, was devoid of life, its creator race—the identity of whom remains a mystery to the Albionites—had been wiped out by the Cybers. They in turn abandoned the lifeless hulk of the platform, having stripped anything of value to them and leaving the rest to fate. The Albionites wasted no time in not only restoring the nomad platform—dubbed Dawn of Albion—but also using their surviving ships to fortify it. Now, at the beginning of the 48th Century, there are whispers of a great white platform that skips between star systems, keeping quietly to the shadows of the galaxy. Dawn of Albion emerges every so often to trade with mercenaries and bold smugglers, only to disappear behind nebulae at the first sign of danger. With economic life returning and new trade routes opening between the five galaxies, it is only a matter of time before the Third Kingdom of Albion emerges to take its place. Talented science fiction authors are beginning to catch the vision of Takamo Universe and are adding their considerable talents to the development of the game making it a rich, immersive environment. 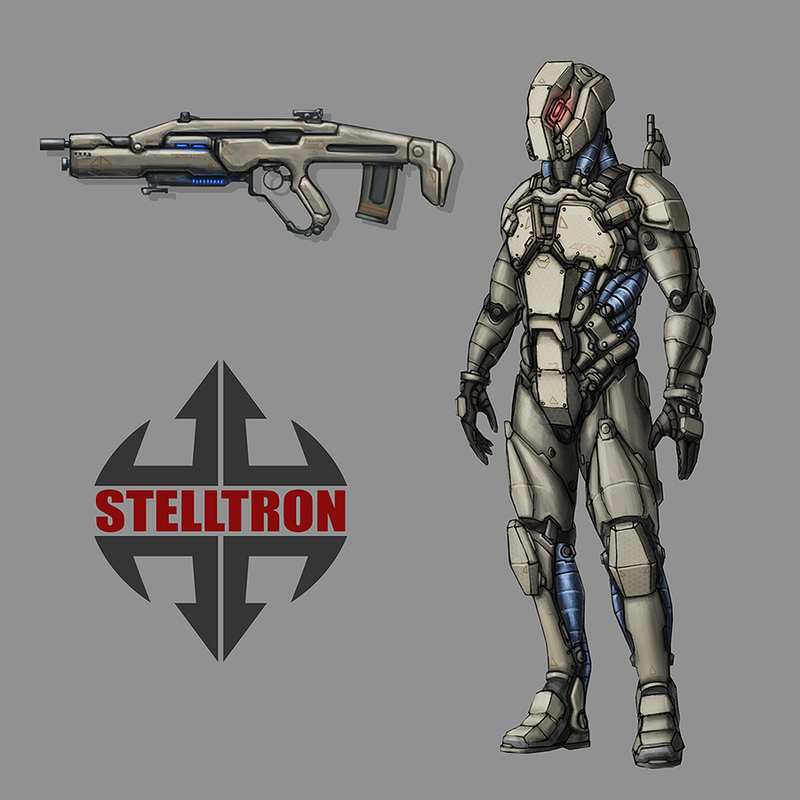 Stelltron regular infantry trooper. Circa 4715.